You don’t have to keep track of which Arch Books you’re missing or when new favorite stories are available. The Family Arch Book Club is a two-year program that fits busy lifestyles and makes Bible learning a family priority. Four times per year, we’ll send you 10 of the newest and best-selling Arch Books for 25% less than you’d pay for individual purchases. That’s an 80-book library! 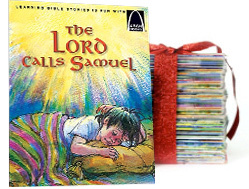 This subscription makes a great gift for grandchildren, godchildren, or any family with young children. Save 25% as a subscriber! You pay $2.24 per Arch Book—just $22.43 (plus shipping) per package. Enjoy a free wooden bookshelf that arrives with the first shipment!